The milk separator helped create a source of income for farm wives and the establishment of the dairy industry in Canada. Nowadays the milk separator is an object of mild curiosity in museums and at antique auctions. There’s one at the Greater Vernon Museum and Archives; when I heard a parent tell her child, “That’s a big mixer” I realized there was a story to be told. My acquaintanceship with the milk separator goes back fifty years; when my sister-in-law went to the hospital to give birth to her first child, I had to wash the separator, an onerous task (I was an ungrateful teenager). There was still something intriguing about how the separator worked; a big bowl to pour the milk into, a set of disks in a cone-shaped contraption, two spouts, and a handle to turn. The disks were the worst part; there seemed to be hundreds of them, but probably there were only 25. We grew up drinking unpasteurized skim milk; we survived, of course, but now when I think about those days, I recall Adelaide Hoodless who founded the Women’s Institute and Macdonald Institute partly because her 18-month old son died from drinking tainted milk. 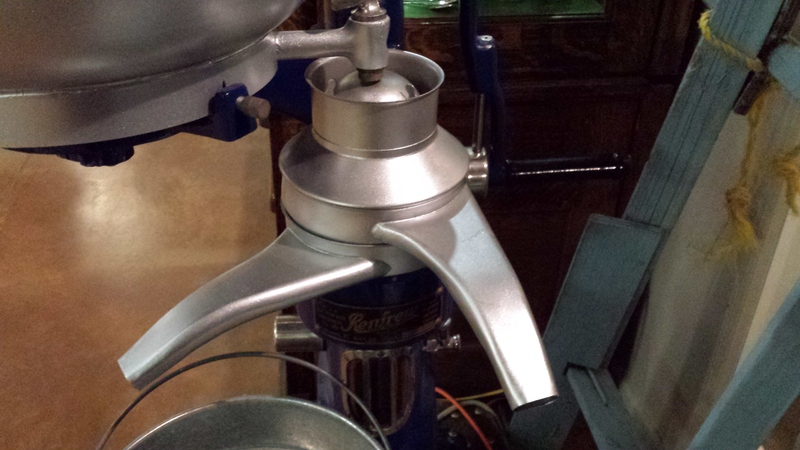 The milk separator created a revolution in the dairy industry. Up to its introduction to Canada in 1882 (from Denmark) milk had to be separated in a laborious, pathogen-producing process; whole milk from the cow was set in a tray and left for up to 24 hours for the cream to rise to the top. The separator did exactly what its name describes; the lighter cream was spun out one spout and the heavier skim milk out the other through a set of disks through centrifugal force. The separators were hand-turned until electrically-powered ones took over. The milk separator is an unrecognized, but major contributor to Canadian life. Dairying quickly became a productive and important aspect of women’s farm work. The crops might fail; but the cows usually freshened. There are many more stories that can be written about the dairy industry, but it all began with the milk separator.